(Photo: WCC / Renta Nishihara. )WCC President for Asia, Rev. 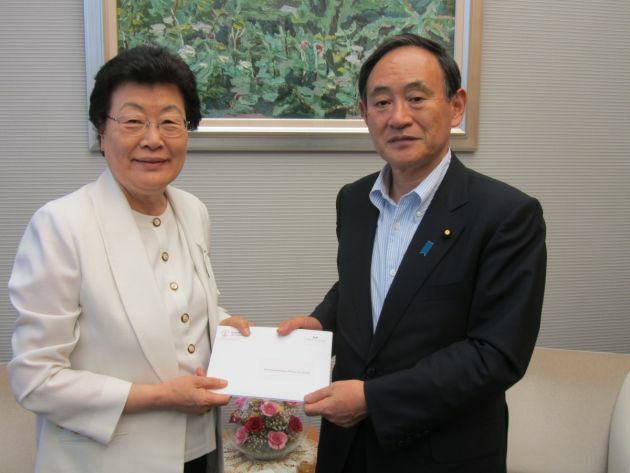 Sang Chang (L) meets with the Chief Cabinet Secretary of Japan, Yoshihide Suga on August 4, 2014. World Council of Churches Asia President, Rev. Sang Chang, has met with the Chief Cabinet Secretary of Japan, Yoshihide Suga, to discuss nuclear dangers and the peace clause in the country's constitution. The visit came in Tokyo on August 4 two days before the 69th anniversary of the atomic bombings of Hiroshima and Nagasaki by the U.S. at the end of World War II. She discussed two statements from the WCC's main governing body, "Towards a Nuclear-free World" and "The Re-interpretation of Article 9 of the Japanese Constitution." The WCC, which seeks worldwide Christian unity, said in an August 6 statement that Chang delivered as a "show of solidarity" between the churches council and the Japanese churches. Chang noted in her presentation the WCC's declaration that "nuclear weapons cannot be reconciled with real peace." She also referred to the assistance churches have given to some 370,000 survivors of the 2011 nuclear disaster in Fukushima following a massive earthquake and tsunami. "We would like to request the Japanese Government to ensure better protection of public health in all areas affected by the Fukushima Daiichi tragedy and to phase-out nuclear power plants," said Chang, an ordained minister in the Presbyterian Church in the Republic of Korea. Regarding current moves to re-interpret the Japanese constitution's peace clause Chang noted, "We urge the Japanese Government to honour and respect both the letter and the spirit of Article 9. "We make this request bearing in mind the strong support for Article 9 among the Japanese people and the deep appreciation for Article 9 in the countries of East Asia." Speaking on cooperation between the WCC and Japanese churches, Chang said. "Although the Japanese churches are a small minority in Japan, we believe that their witness on critical issues in Japanese society serves as a beacon of light and hope for the Japanese people. "Therefore, the WCC will continue to work closely with the Japanese churches and Japanese people on the pilgrimage of peace and justice." Chief Cabinet Secretary Suga replied that as the only country to have suffered an atomic bombing Japan has "taken the responsibility to address the nuclear problem." He expressed his gratitude to the WCC and the churches of Japan for their various support in response to the situation in Fukushima. Concerning the peace clause of the constitution Suga said, "The right of collective self-defense is recognized everywhere around the world and global conditions have changed significantly in recent times. "Thus we have come to consider the right to collective self-defense within the framework of Article 9 of the Constitution." Rev. Renta Nishihara Nishihara a member of the WCC's central committee from Japan said, the response of Chief Cabinet Secretary Suga was consistent with previous government views. "This opportunity to convey a message from Christians around the world and in Japan to the Chief Cabinet Secretary, essentially the second ranking official in charge in the Japanese government, was historic and carries with it immeasurable significance." Also participating in the visit were Nishihara, Rev. Makoto Kato, executive secretary of the United Church of Christ in Japan, Rev. Hiroko Ueda, formerly the Acting General Secretary of the National Christian Council in Japan, and Yoichi Noguchi of the Niwano Peace Foundation.